The link will take you to the search page of The London Gazette which has been set to search between June 1914 and December 1920. Type the name of your soldier into the search bar on the left-hand side of the page and click Update Results. You will then be given a list of results. To open a result, click on the blue underlined heading. Unfortunately, while the London Gazette is full of useful information being able to find what you are searching for can be very difficult. This is due to the London Gazette search engine using Optical Character Recognition (OCR) to convert scanned pages into searchable text. However, there isn’t a 100% accuracy rate and certain letters can be confused with one another (c and o, i and l). If you are having trouble searching for a soldier who should appear, try a combination of their names, unit and the reason for searching (award, rank, etc.). However, even searching a combination will sometimes bring no results. The undermentioned Second Lieutenants to be Lieutenants: Philip Saltmarshe. Dated 2nd July, 1915. The undermentioned Privates from the Duke of Lancaster’s Own Yeomanry to be Second Lieutenants. 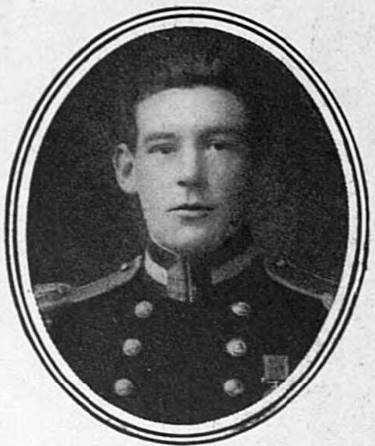 Dated 16th June, 1915: Donald Marshall. Kenneth Mudie. However, officers who were promoted did not always have their name in full and you will need to search by initials. For Philip Saltmarshe I also searched “P. Saltmarshe”. If you are searching for an unusual surname like Saltmarshe I would suggest only searching the surname. Promotion dates can also be found by looking at the relevant Army List. I have written guides to using the British Army List, Hart’s Army List and the Indian Army List. Victoria Cross: There is always a citation. Distinguished Conduct Medal: There was always a citation. Military Cross: There was often a citation but not always. Citations may appear in the same London Gazette the medal was gazetted in or in a later issue. Military Medal: There are only a handful of citations carried in the London Gazette and this is the most difficult gallantry medal to research. The original citation cards for the military medal were destroyed during the Blitz. However, once you have located the date a military medal was gazetted (approximately 3 months after the act of gallantry but a lot of gazettes referred to specific time periods a lot earlier than 3 months), you can consult the unit’s war diary or soldier’s local newspapers to try and find out the circumstances for which it was awarded. If you research a lot of officers, then I would recommend buying a copy of For Distinguished & Meritorious Services in Time of War: The Great War Recipients of the Military Cross 1914 – 1920 by Peter Warrington. This book contains a complete list of those of the British and Commonwealth who were awarded a Military Cross during the war, along with the date it was gazetted and the citation was published (if there was one). I constantly use this book in my research and it has enabled me to find citations which I could not find by searching the London Gazette. The link below will take you to Amazon but you can often find it on sale on the Naval and Military Press website. 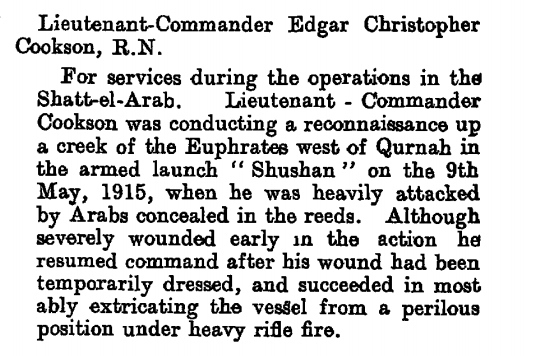 Below is the announcement of the award of a Victoria Cross to Lieutenant-Commander Edgar Christopher Cookson which appeared in the Supplement to The London Gazette on Friday 21 January 1916. 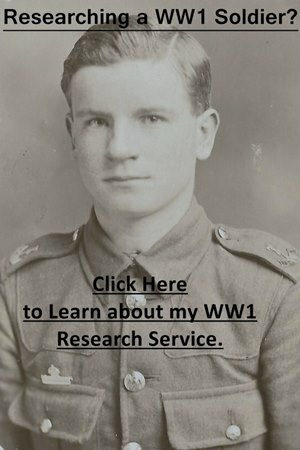 If you are researching a soldier who served in the First World War click on the photograph below to learn more about the research service I offer.